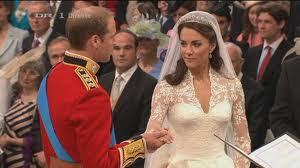 Kate and William -- I Just Love a Royal Wedding! You are here: Home / Parenting Blog at KidsAintCheap / Random Musings / Kate and William — I Just Love a Royal Wedding! Kate and William — I Just Love a Royal Wedding! I’ve gotta tell you, I am really looking forward to the upcoming wedding of the handsome Prince William and his beautiful bride-to-be, Kate Middleton — which will take place on April 29th 2011. I am such a geek for the British Royals. I really am — and I don’t care who knows it. I have already watched three TLC specials documenting the upcoming affair, as well as a look back at royal weddings of the past. After the death of Princess Diana in August of 1997, I sort of lost touch with my love for all things royal. That is until Prince William announced his royal engagement. I knew it would happen eventually, but didn’t expect to be looking forward to it as much as I am. As a little girl, I loved fairy tales and dreamed of being a princess. So when I found out there was a real live prince, and he was soon to be married to a striking and sweet young woman – to me – it was like a fairytale come to life. Maybe there weren’t any dragons to slay, poisoned spinning wheels or apples, and though I was sure a pumpkin – turned carriage – wouldn’t be carrying the princess-to-be, I was still hoping for a little magic. I was six years old when Prince Charles married the Lady Diana Spencer, On July 29th, 1981. I was glued to the TV that day. It was the most magnificent thing I had ever seen. Ever! Prince Charles looked so handsome and Diana was breathtakingly beautiful. Her dress was everything I imagined a princess would wear, and more. I loved every detail of the event. The huge bouquet Diana carried, had flowers cascading down the front of her dress, almost all the way to the floor. It was just amazing. The crown she wore with her veil, was absolutely stunning. The train on her dress — Oh! That train! Magnificent. It was 25ft. long; the longest train in British Royal history. After the wedding, my grandparents bought me lots of books on the subject. They are mostly coffee table books, with glossy pictures of the engagement, wedding, honeymoon, and then the birth of William. I thought Diana was just beautiful and because of this I would often ask to have a “Princess Diana” hair cut. My Mom finally conceded to my request and believe me when I say, it was not a good look for me. So — as you can imagine, I was heartbroken to learn that the fairytale was not to be. I still loved Diana, and to this day I have never read any of the unauthorized tell-all books people have written about her. I was teary-eyed as I watched her funeral, but actually wept as I watched her two precious boys walking behind her coffin. That still gets to me. Even though the royals haven’t had the best of luck in the marriage department; I have high hopes that Prince William’s marriage will be long lasting. Sadly, I didn’t receive a royal wedding invitation, but you can bet that I will be watching – eyes glued to the TV once again – to witness the wedding of a future King and his Princess. Are you excited for the royal wedding? Does news about royalty interest you in general?